Before the reform of the General Roman Calendar today was the feast of St. Hyacinth. I like reading more about the saints of the old calendar. It's like meeting an amazing person for the first time. Of course, the lives of the saints are always interesting and edifying, regardless of how popular they may be today. 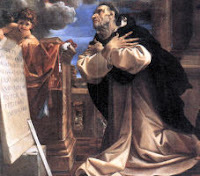 While a canon at the cathedral of Cracow, Hyacinth journeyed to Rome, was impressed by the preaching and miracles of St. Dominic, and from the hand of Dominic himself received the habit of the newly-founded Order. Upon returning to his native land (1219), he established monasteries of his Order beyond the Alps at Friesach, Prague, Olmiitz, and Cracow. From the Breviary we have this miracle. With three companions Hyacinth had arrived at the banks of the river Weichsel during their journey to Vischegrad, where they were expected to preach. But the waters had risen so high and had become so violent that no ferryman dared to cross. The saint took his mantle, spread it out before him, and with his companions rode across the raging waters. After saying his Office for the day, he died in 1257 with these words on his lips: "Into Your hands, Lord, I rest my spirit!" Being so near to DC, we often have brothers visiting our campus from the Dominican House of Studies. One of my favorites (until my two friends in the novitiate get there!) is Br. Hyacinth. When I first met him, I said, predictably, "Hyacinth? Like the flower?" He was like, "No, like the Dominican saint." He gets that ALL the time.